Well, here we go again! ‘Another unsettled month in Eden’. 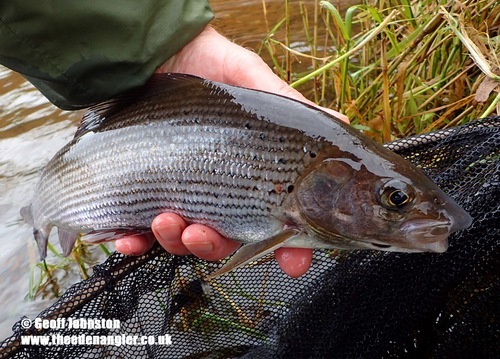 Chasing October grayling wasn’t a complete washout, but it was another very wet month. Our rivers were high, and often unfishable for most of it. Now they – the weathermen – are forecasting the coldest winter for years, with temperatures predicted to plummet over the coming months. Based on their record for accurate forecasting for our area: ‘don’t hold your breath’ for that, I know I certainly won’t! But at least, if they’re right, we will hopefully get a spell of cold and dry weather with the rivers at a decent and fishable level for a while. The rivers were still high on the first of the month, but they were falling after a big rise on the final day of September. Eden was just fishable for Peter and Sven’s first taste of chasing grayling. 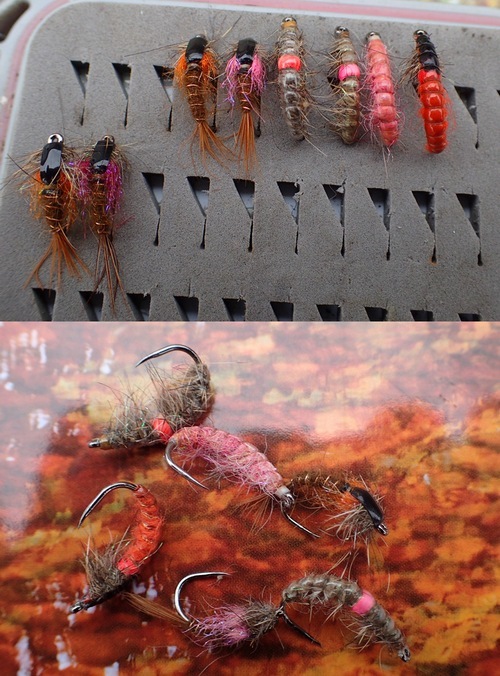 Much of the day was spent on the nymph. Although, we did get a trickle of Large Dark Olives in the afternoon and a couple of fish were spotted at the surface. 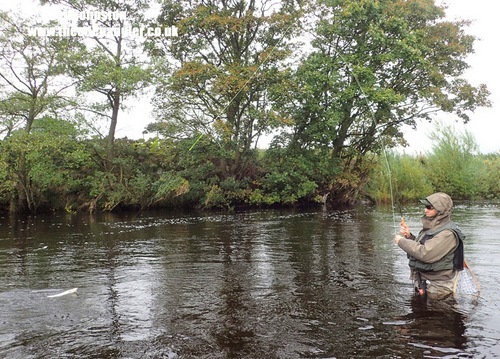 The dry fly would probably have tempted them, but as the boys wanted to sample a bit of ‘ North country spider’ fishing….I went through leader set-up, appropriate flies, presentation and bite detection etc. with Peter and then we had a trial run before moving onto the fish. All went well and Peter was soon covering ‘the zone’. 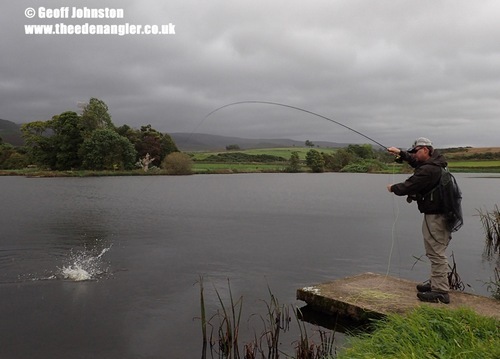 When it came, the take was really subtle, which I expected in the softer flow where the fish were showing. It was never going to be the arm-wrenching pull that you often get in faster water. The line gently slid away, the hanging line from rod tip to water slowly lifted, I said ‘strike’ and Peter was into his first spider-caught grayling! It was text-book. All went exactly as planned. Apart from: the commotion from the hooked fish put down the other rising fish. We waited for a while, but there wasn’t enough fly on the water to tempt the fish back to the surface – so we eventually moved on. We had more overnight and early morning rain for Peter and Sven’s final day with me. Eden was rising fast, so, rather than waste the day, we decided to hit one of our local stillwaters to chase a few Rainbow trout. The weather remained miserable with squally showers at times, but both managed some action…. River levels were up and down – more up than down! – during the first two weeks. 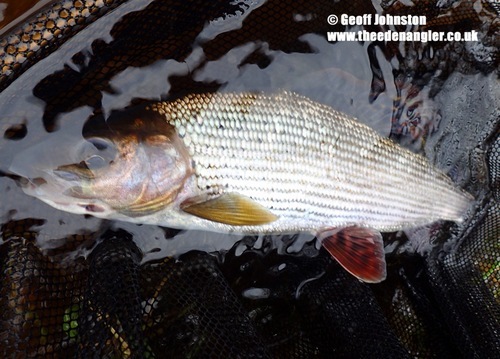 It was the 16th when I eventually managed my first session of the grayling season. I know that the official start of the grayling season is the 16th June, but I always think of my season as 1st October to 14th March. 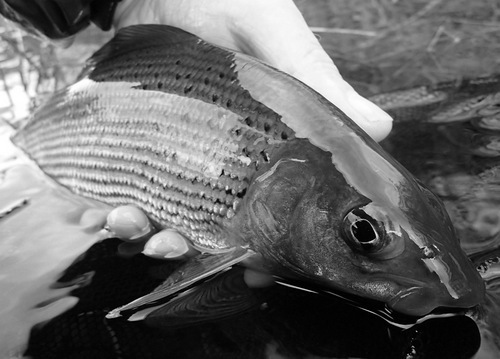 This is the time when it’s closed season for trout and I concentrate solely on the grayling. The river was still a touch on the large side on the 16th. But with the remnants of Hurricane Ophelia heading over the Atlantic and due to hit us that evening, I decided to go for it. Fish appeared to be hugging bottom. 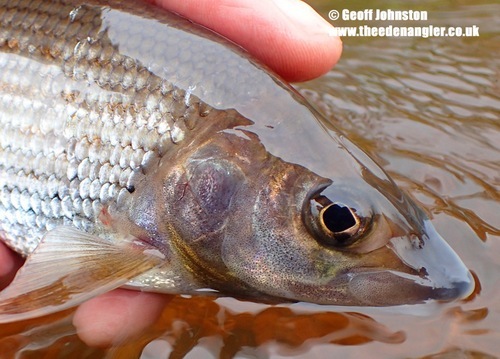 Going deep with a combination of my favourite winter bugs produced my first grayling of ‘the season’. Ophelia swept over the region in the evening and overnight, hitting us with a strong winds and rain. The rivers rose slightly on the 17th. River levels continued to fluctuate over the third week and guided days had to be cancelled. I managed to sneak out, but the conditions were far from ideal. Okay for me, but too big and iffy for clients; the safety and enjoyment of my clients is paramount…. Concentrating on the few holes that I knew that would fish helped me to eke out a few short stints on a big river. A session on the 24th was cut short by a rising river. Early morning readings on the Environment Agency gauges for Eden suggested all was well. It was when I arrived and a couple of early fish lifted my spirits. But the river began to rise at lunchtime. It was up eight inches and rising by early afternoon – and that was the end of my fishing for that week! We had our first frost of the winter on the final day of the month. I don’t usually like the ‘first frost’. But I’d already planned to go out and, despite my misgivings, I had a good session. It just shows that you can ‘never say never’. I guess the saving grace was that the weather and water temperatures had been pretty low in the period leading up to it. So, even though all was white with frost on the morning of the 30th; we didn’t get the severe change in conditions that can often be the fisherman’s anathema. Water temperatures are down now so my thermals have come out of hibernation. Breathable waders are normally put away and neoprene’s are brought into play to see me through to March. But I’ve given up on them. I don’t know what it is with today’s gear! My old neoprene waders were bulletproof and would last for years, but my last few pairs have developed seam leaks after relatively little use. So now I just layer-up under the breathable’s. Today’s lightweight waders aren’t much better…but I guess the less said about modern waders – and their repairers – the better…. If you’re going to be like me and plan to brave the elements in search of ‘The lady of the stream’ over the coming months; I hope that your waders stay leak-free and don’t forget your thermals!